Svalbard (High Arctic, Norway), 1994 (The Northern Atlantic Maritime Communities Program: development, ethnicity, man-environment relation).. 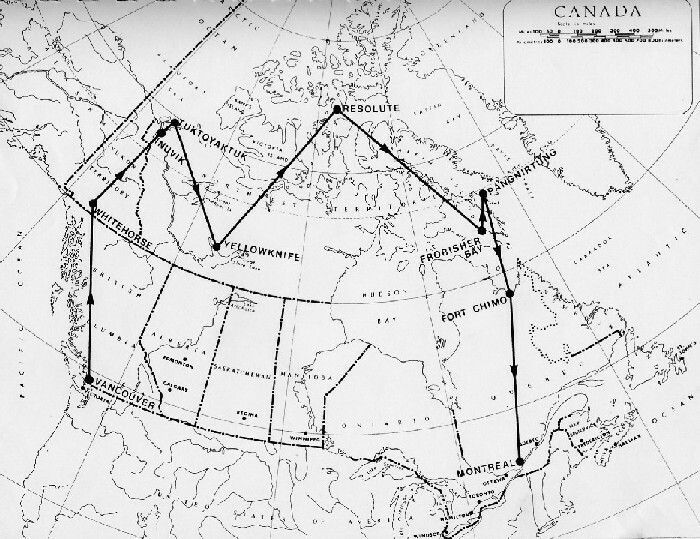 The Survey itinerary had an approximate "bow" form and totalized almost 7000 Km, going from West to East - I was coming from South-Eastern Alaska and Yukon-, with an "arrow" form in the center, due to the flights to and from Yellowknife, to approach Resolute Bay, in the High Arctic, close to the Magnetic Pole (500 Kms) and at a distance of 1700 Kms from the North Pole. Inuvik - Inuuvik- 68°21' N (3000 inhabitants: Inuit -Inuvialuit- , Eurocanadians and Dene-Loucheux Indians); Tuktoyaktuk - Tuuktuujaartuq - 69° 27' (818: 80% Inuit); Resolute 74° 42' (305: 50% Inuit); Frobisher -Iqaluit- 63°44' (2333: 1465 Inuit); Pangnirtung 66° 8' (957); Fort Chimo - Kuujjuaq - 58° 5'(1100: 865 Inuit and 250 Ouiouititut and Qallunaat (French and English speaking Eurocanadians). Map enclosed in the detailed and bulky Briefing Book kindly given to me by The Indian and Northern Affairs Canada (Affaires Indiennes et du Nord Canada) in Ottawa, during the meeting I had with Canadian Experts on Arctic and Inuit Matters. The only difference is in the fact that I didn't fly from Vancouver (British Columbia) to Whitehorse (Yukon). From Vancouver I had the following itinerary: flight Canadian Pacific Vancouver- Prince Rupert (Northern British Columbia). I embarked on the MV Malaspina of The Alaska Marine Highway System North Bound to Wrangell (South-Eastern Alaska). After I embarked on the Taku, South Bound to Ketchikan (in practice, I went back, to visit the place). Flight Alaska Airlines Ketchikan-Sitka (so I went again towards North...). Again I embarked on the Taku, North Bound to Skagway. As the train of The White Pass and Yukon Route was then stopped, I reached Whitehorse by an Atlas Tour bus. I arrived in the first Arctic Community of my survey (INUVIK) on board of a very old twin-engined DC3 of Trans North Turbo Air, that en route stopped in the "ghost town" of Dawson and, afterwards, in the indian village of Old Crow, already North of the Polar Circle. I should add that I reached the sides of the Polar Beaufort Sea (Tuktoyaktuk) thanks to a small plane not in IATA (Kenn Borek Air Air Taxi). Later I made the long flight from Yellowknife to Resolute Bay on board of a mix-cargo-passengers of Pacific Western Airlines. My North-American travel of August- Sepember 1983 (Rome, Toronto, Québec, Vancouver, Island of Vancouver: Quadra Island, Alert Bay - Cormorant Island -; Northern British Columbia, Alaska, Yukon, North West Territories, Nouveau Québec, Montréal, Rome) has required altogether 38 flights on 9 Airways, 2 itineraries by car, 1 by bus, 9 by boats! But also the Students: Joyce Kalluk, Terry Nungaq, William Amarnalik, Joan Tompkins, Martha Laverty; the Teachers: Anna Nungaq, Elizabeth Dederich, Leesee Karpik; the Interpreter Mary Ekho Wilman; the Hunter Levi Evic; the Sculptor Davidee Atchealak …and Fred Gruben, Rick Daitch, and Sakiasie Sowdmapik (Parks Canada, in Pangnirtung). 2002 "Lungo i sentieri dei caribù e tra i ghiacci spazzati dal vento guidati dalla sorprendente "cartografia mentale" degli Inuit. Le esperienze storiche di esploratori e antropologi che testimoniano di una particolare dote degli Eschimesi. Il primo nella storia a servirsi delle conoscenze geotopografiche degli Eschimesi fu William E. Parry che tra il 1821 e il 1823 esplorò l'artico orientale canadese aiutato dai disegni di un'anziana Inuit", L'Osservatore Romano, 3 agosto 2002, 3. 2002 "Un etnologo autodidatta fondò la moderna echimologia. Knud Rasmussen e i cento anni dalla "Spedizione Letteraria Danese" in Groenlandia", L'Osservatore Romano, 5 maggio 2002, 3. 2002 "Nel gelo della "terra degli orsi" per misurare un arco di meridiano. A cento anni di distanza dalla spedizione russo-svedese nelle isole polari Svalbard", L'Osservatore Romano, 2 Marzo, 3. 2001 "La storia di un uomo tra due poli. Moriva 50 anni fa l'aviatore americano Ellsworth il cui nome è legato all'impresa del "Norge", ma non solo", OR [L'Osservatore Romano] Domenica, 7 Ottobre, 6. 2001 "Per tre anni la "Fram" si fece trasportare da un imprevedibile tappeto di ghiaccio. A Oslo un museo custodisce la nave che l'esploratore Fridtjof Nansen guidò nel 1893 in una storica spedizione polare", L'Osservatore Romano, 30 Maggio, 3. 2001 "Per un millennio nella Russia artica alla ricerca del "tesoro del Nord". Dal X secolo fino al 1917 i cacciatori Pomori hanno solcato le acque del Mar Bianco", L'Osservatore Romano, 22 Aprile, 3. 2001 "L'uomo del Passaggio a Nord Est. Cento anni fa moriva lo svedese Nils Nordenskjöld uno dei più grandi esploratori dei tempi moderni", OR Domenica, 4 Febbraio, 6. 2001 "Il relitto della celebre Maud di Amundsen - Sverdrup", Rivista Marittima, CXXXIV, Febbraio, 190-193. 1999 "I virus custoditi dal ghiaccio artico possono conservarsi anche per migliaia di anni. Un monito alla cautela per gli scienziati che effettuano esperimenti in Groenlandia", L'Osservatore Romano, 18 Dicembre, 3. "The Human And Geographical Sciences In The Arctic, Priorities And Perspectives: An Introductory Outline", in press (CNR, Italian National Research Council). Paper read on the 15th May 1997 in the International Workshop held at Ny Ålesund (Spitsbergen Island, Svalbard), during the Official Opening of the Italian Arctic Base of the CNR "Dirigibile Italia"